Perhaps because he wanted to avoid an income tax audit, when Adam Sandler went on a summer vacation alongside four of his closest friends, he packed along a camera, reels of film, Oscar caliber actresses Maria Bello and Salma Hayek and director Dennis Dugan in order to write it off as work. Unfortunately for Sandler fans everywhere, the enjoyment of the vacation is entirely lost on us once we settle in for the lazily crass yawner dubbed Grown Ups that was released to justify the Happy Madison Productions expenditure -- not to mention help keep under-utilized SNL alumni pals like Rob Schneider, Kevin James, Colin Quinn and Tim Meadows employed. Borrowing heavily from The Big Chill , Indian Summer and The Great Outdoors among other “reunion” pictures, while Dugan's cliché heavy, formulaic Happy Madison on autopilot effort misses the fresh, freewheeling spontaneity of mid '90s Sandler pictures, admittedly its heart is in the right place. And additionally, by casting Chris Rock and Rob Schneider against type as a sensitive house-husband and granola hippie with an elderly wife, it manages to keep us from pressing eject even after we realize that much to our disappointment, the best we can hope for are smiles rather than gut-busting laughs. Undoubtedly it's one of those films that would've been infinitely more entertaining to watch as a bit player or crew member from the sidelines to see five close comics one-upping each other in between takes as opposed to dumbing it down for generic laughs. For overall, Grown Ups lacks the uproarious hilarity we've come to expect from some of the superior work put forth by its large ensemble cast. Essentially Sandler plays the same easygoing nice guy man-child archetype he's perfected in countless other pictures. And in Grown Ups, he's the unofficial leader of a group of five childhood friends that comes together decades after winning a junior high basketball competition in order to reconnect for the funeral of their treasured coach and mentor. A powerful Hollywood agent married to a successful fashion designer (Hayek) complete with spoiled children who text their nanny and demand obscure brand name bottled water, it's only after Sandler's character begins to reminisce about the nostalgic good old days of togetherness in the outdoors that he realizes that a trip to the past with those from his past is precisely what he needs to get back on track. Over the course of an impromptu long holiday weekend at the lake, the men bond together thanks to their overwhelming desire to rediscover what it means to be a part of a family or a member of a circle of formerly close-knit friends. And although they haven't seen each other in ages and initially -- as in the case of Kevin James' character -- they overcompensate by trying to project the best possible versions of themselves, soon they're forced to be uninhibited around people who know them the best. Thus predictably these Grown Ups learn that they're still maturing works in progress. But despite its simple, positive message along with a few poignant speeches and revelations about certain existential crises faced by certain individuals that may have actually managed to tug our heart strings if they hadn't been bookended by scatological low-brow humor, the movie never manages to come together as a cohesive whole. When it comes right down to it, the major malfunction seems to stem from the simple issue of mathematics as it's bogged down by too many main characters. For as difficult as it is to introduce five men to viewers, it's even tougher to incorporate wives, girlfriends, children and pets. In addition to mostly leaving them sidelined for simple jokes here and there, unfortunately more than half of the people onscreen are about as deep as a cardboard cutout with one or two descriptive words written on it to sum them up, regardless of the fact that it's a true revelation of casting against type for Sandler and company to relish in Maria Bello's untapped knack for comedy. Yet, it's the “boys will be boys” tagline that draws the most emphasis and lack of believability in the overly convenient, protracted one-dimensional payoffs that provide an emotional band-aid or quick fix to some very real issues hinted at with regard to some members of the core quartet. And just like it's hard for the cast to move without tripping on the loose strands of plot that never go anywhere, it's all the more upsetting when you estimate the movie's potential for genuine laughs given the talent involved. Seeds for jokes and the beginnings of breezy banter are scattered left and right but wind up abandoned. The comics discard their natural gifts for fast but lazy gags designed to appeal to the lowest common denominator. And this approach manifests itself repeatedly for the worst for Kevin James, who sacrifices his dignity while taking several for the team as mere fat guy fodder in Grown Ups, to the point that Paul Blart: Mall Cop begins to look downright Capraesque by comparison. 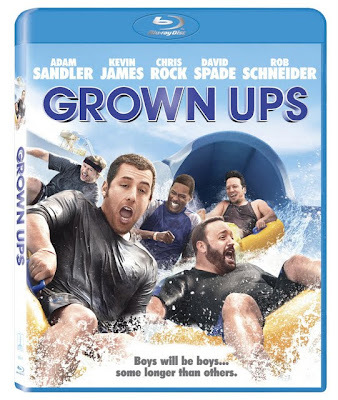 Although the release of Grown Ups provides fiscal and visual scrapbook proof of just how Adam Sandler and company spent their summer vacation, ultimately it's one trip that the cast's fans are not only sure to forget but also sure to avoid packing along the next time we bring a Happy Madison title with us to the lake, unless somehow we can figure out a way to write it off too.